Home electrical problems vary in complexity, and therefore should always be attended to by professional electricians with the right equipment, experience and knowledge. The following are some examples of common household electrical problems. Problem: Flickering or blinking lights. Diagnosis: Poor connection at some point in the circuit. If the phenomenon occurs throughout the house, the cause may also be a faulty main wire connection. Solution: Hire an electrician to locate and repair the source of the problematic connection. Problem: Recessed light goes on and off. Diagnosis: A built-in safety mode that prevents the light from overheating. This usually implies that the wrong fixture or wrong wattage of the bulb is in use or that the ceiling-space insulation is touching the recessed light fixture. Problem: Some lights go extra bright while others dim out, popping bulbs, electrical appliances die out. Diagnosis: A faulty main neutral connection is causing this condition. 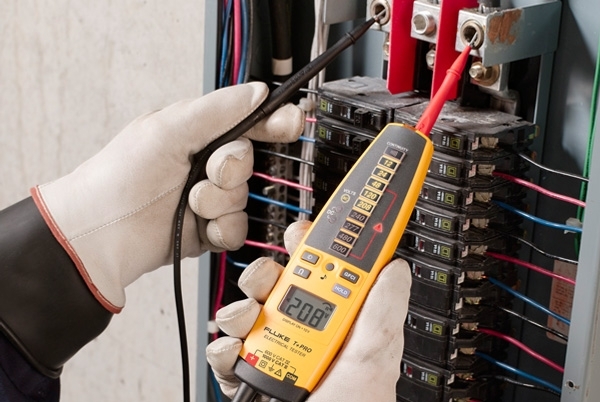 Solution: Have a licensed electrician immediately repair main neutral connection to prevent the deterioration of the electrical equipment. Problem: Circuit breaker trips when high-wattage items are in use. Diagnosis: Overload on the circuit. Solution: Either limit the use of high wattage items such as microwaves or hair dryers on the same circuit or have an electrical contractor install a separate circuit dedicated to heavy wattage appliances. Diagnosis: Loose connection due to a back-wired receptacle (wires connected directly to the back of the receptacle instead of being wrapped around the screw). Solution: Have an electrician locate and replace all the back wired receptacles in the home. In some cases the source of the problem is not a back wired receptacle but a loose neutral connection – this too will also require professional handling. Problem: No electrical power in the home. Diagnosis: Loose connection at the point where the power company wires feed to the service wires in your home. This faulty connection can also be located further out, somewhere along in the power companies system. Solution: Hire a professional electrician to locate and repair the loose connection. Until the problem is fixed, refine from using any 220V appliances such as your electric cook-top or range, central AC or electric dryer. Diagnosis: A seriously damaged electrical device. Solution: Don't ignore the fishy odor as it signals a serious electrical problem. Turn the power off to the smelly appliance and immediately call an electrician for a prompt solution. Diagnosis: Spikes are brief bursts of extra voltage while surges are longer bursts of too much voltage. Both have the ability to destroy electronics instantly or overtime. Both can be caused by external disturbances like storms, or by automatic or manual turning off of microwave ovens, air conditioners, coffee makers or power tools. Solution: Have electricians install plug-in surge protectors to safeguard individual electronic items against surges, spikes, electrical noise and outside disturbances. Problem: Sags, dips and power outages. Diagnosis: Sags and dips are short periods of low voltage while power outages or blackouts are periods of no electric power. While sags and dips can be caused when an electrical appliance draws power as it is switched on, blackouts are usually the result of harsh weather, damaged equipment of the power company or short circuits in the home. Sags, dips and outages can cause data loss or damage to computers, answering machines, microwaves, and faxes and other electronic devices that use memory. Solution: Have an electrical contractor install Uninterruptible Power Supply (UPS) units. UPS units operate "online" to filter out power disturbances and provide free flowing electricity during normal conditions. UPS units are equipped with battery backup systems in case of a blackout. Get a 100% free written price quote for any service upgrade project. Schedule a Customer Visit.